As mentioned on her brother’s site, we have some video from Christmas this year. Although a majority of the pictures over there were taken on Christmas Eve, this video was shot on Christmas day. It isn’t indicated in the video, but the first portion has all the kids at the beginning of the morning and them opening some gifts. 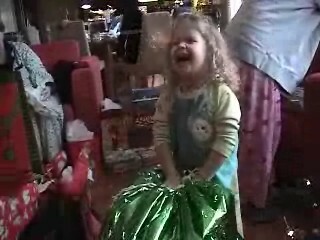 The next portion of the video is just Mara opening some of the rest of her gifts while the younger ones take a nap. It just took so long to get through all the gifts that the kids got this year, we spent almost the whole morning opening things. Needless to say it was difficult getting them through the morning. With every gift for Mara she wanted to open it up and play with it right away. It took some finagling to get her to move on to the next gift each time. You might even catch a sourpuss face on her every once in a while as if she doesn’t want to open the gift, because she is still thinking about the last one we wouldn’t let her play with. This is a VERY big file. Start to download it, then walk away for a little while.